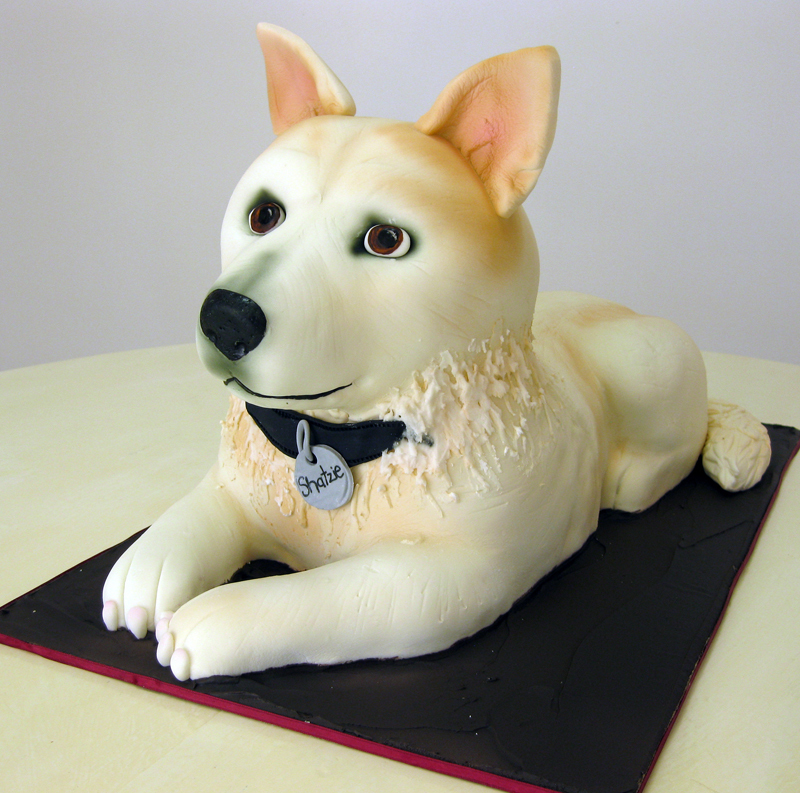 This last weekend we had 3 sculpted dog cakes in two days. 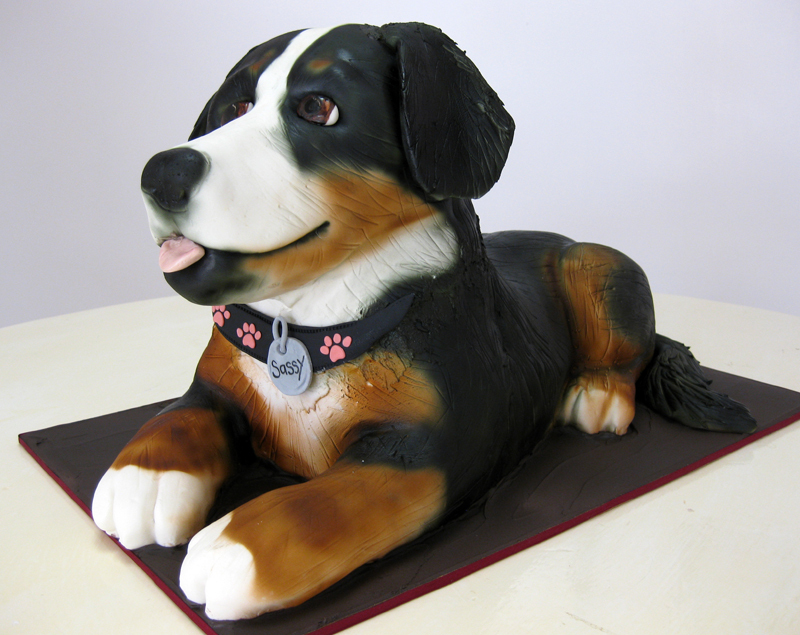 Sculpted dogs are one of our most popular cakes, close in number to car and purse cakes. First off is Riley, an Alaskan Malamute. She was a surprise from mom for the bride and groom at their rehearsal dinner. Notice how she signed the message with her paw print. 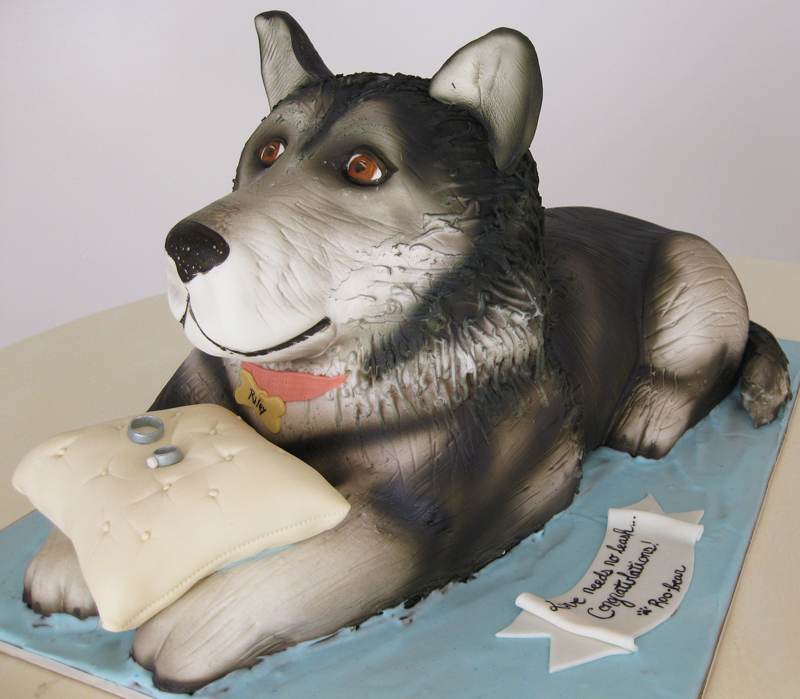 Instead of a traditional wedding cake, this couple got their two dogs as their wedding cake. They were displayed side by side at the reception. 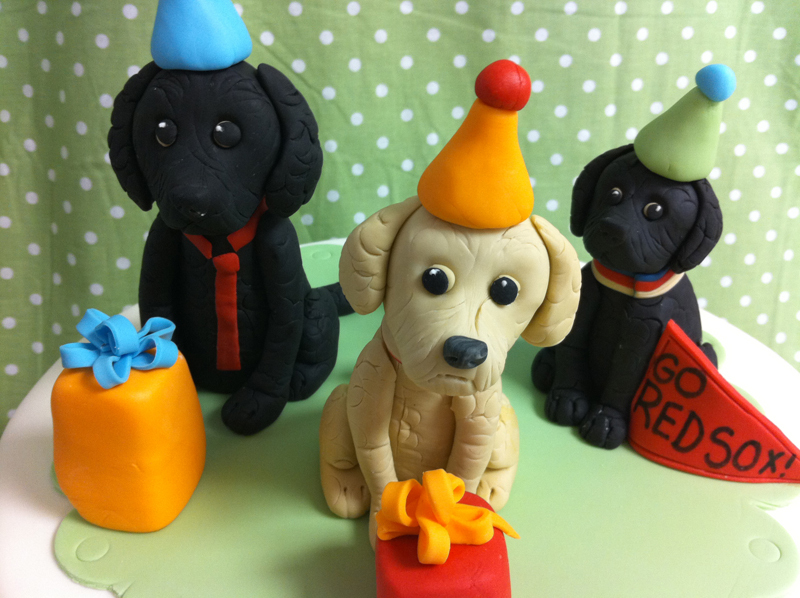 Below are figurines of the birthday girl’s 3 dogs (who are also Red Sox fans) all decked out for the party. This cake was for a mom’s 40th bday. Their dog’s getting into trouble with mr. crab. Thanks! Use rice crispy treat for the head, and the body is just cake stacked, buttercreamed, and sculpted like normal. We’re thinking about doing a book later this year that would give more detail, but I hope that can get you started at least! I agree that your cakes are fabulous. You have real talent! I’ve tried using rice crispy treats for the head and body of a dinosaur cake that I made, but it eventually fell down and apart. I normally work with whipped cream frosting and that’s what I used to cover her body (the cake part) and the rice crispy treat part. Is that too wet of a frosting or did I need to make the rice crispy treats differently from the conventional recipe? Or perhaps I needed to let the rice crispy treat set and dry a little longer? Please help! Thank you. do you have instuctions on how to build a boarder collie dog i love your cakes and i am in desparte need on where to start ty berlynda. It would be a long-winded answer to go through every step. But basically we start with several images of the dog for reference. We build the body out of cake and the head out of rice krispie treats. To get the fur effect you could either texture fondant or to make it more believable you could use an extruder to create the long strands of fur. 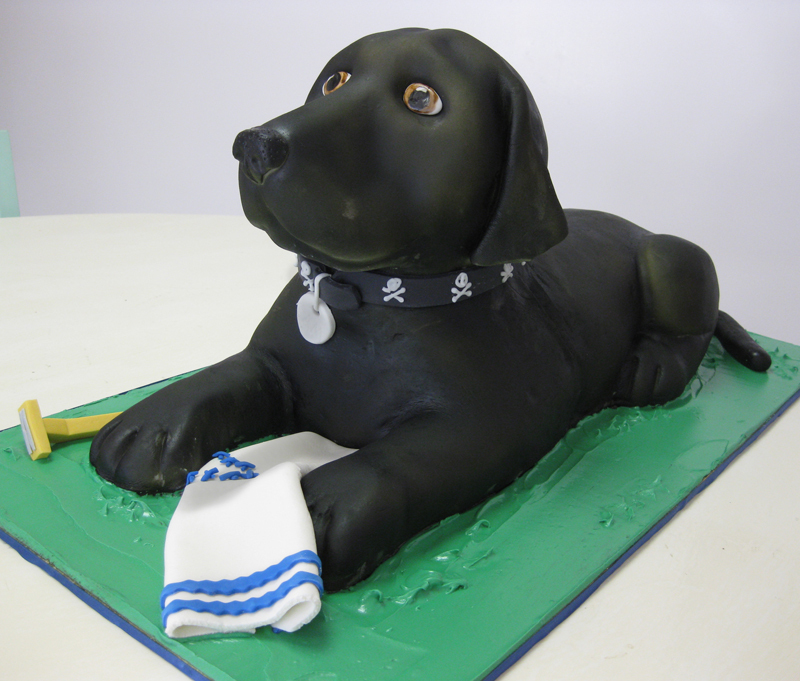 I love your cakes, not seen any like that before, I have a Old English Sheepdog, do you do nay like that? 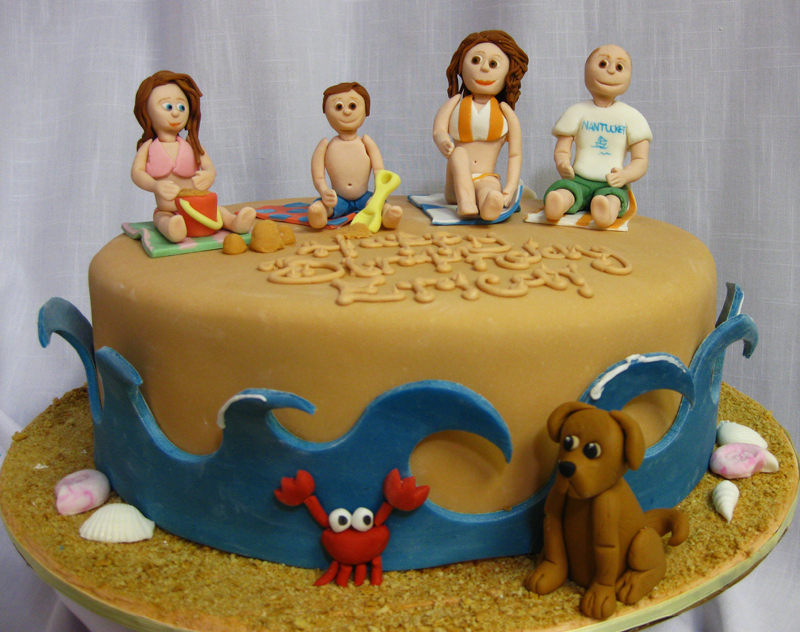 We can create just about anything you can dream up! Please see our contact page if you’d like to place an order. I made a house cake once. I used rice crispies for the roof, but I felt it was really heavy. How do you keep the head from falling off the dogs? We usually use a dowel to help hold the head on, and large straws underneath for support.